There was one major german book about transputers called “Das Transputerbuch”, written by Uwe Gerlach (ISBN 3-87791-019-X). What made this book special was that it included an unpopulated 8-bit ISA card for a transputer and 1MB RAM, fully B004 compatible. 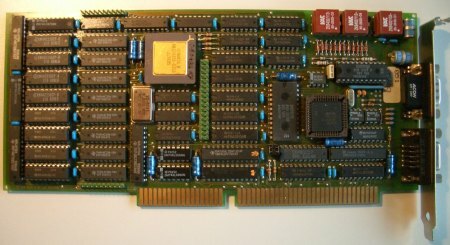 Additionally, there were schematics provided to build a host-adapter for several homecomputers of that time (C64, Apple II, ATARI ST and Commodore Amiga). I was able to get one book off ePay which was still includung the printed circut board and a 360k floppy containing some sample sources and a rudimentary assembler. So I’ve polpulated it, found some mistakes Gerlach made and made it somehow run. The right half is the ISA-bus and link interface. 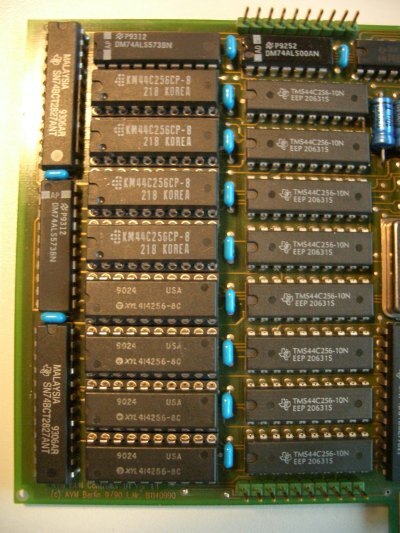 The rightmost and longest IC is a C012 connecting the 8-Bit ISA bus to link0 of the Transputer. Everything else are buffers & drivers. The left half is -besides the Transputer itself- just 1MB RAM and some address-logic. The card would also work without having this side populated using the internal 2 or 4k of the Transputer. C’est ca. As said, prety simple. The orientation of U11 and U12 are wrong on the print on the PCB and in the book, check the photo for them. There are no holes for the capacitor near to U28, you will have to solder it to the corresponding pins on the back of the PCB. The crystal oscillator U12 has its pin-1 not-connected, but it is connected to ground on the board. My crystal oscillator didn’t generate a clock signal, when pin 1 was connected to GND, although it normally shouldn’t matter. Still, there was a persistent problem with the external 1MB RAM. It was detected by mtest but depending on the Transputer-type used and some randomnes, it never was checked as being ok. Thanks to Michael Brüstle and his skills it’s working now – he replaced some capacitors and strenghtened some ground traces but it’s still not clear what the real reason was. Transputers were created to control everything. They were not just CPUs… they could do the video output, control interfaces or even storage devices. So no wonder there were ISDN and SCSI controllers available using transputers. One of those transputer-sporting controllers was the AVM B1 active ISDN card. Back in the PC-AT days, handling the ISDN protocol and traffic could easily bring down your super-cool 80386/25 without a problem, especially if this machine should also fulfill server tasks. In case of the the AVM B1 the CPU was a transputer (T400) and that had reign over a whopping 1MB of RAM! When the card was installed and the DOS driver booted, it actually loaded the transputer code onto the card like any normal transputer card would be fed with code – behaving like an Inmos B004 card and even using the same port addresses. 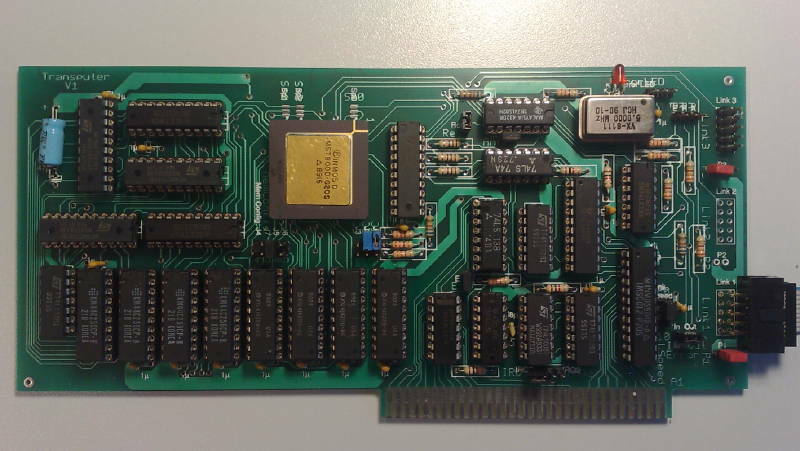 So in fact, the AVM B1 is a transputer card featuring an ISDN-part connected to one of the transputers links. 0 T400b-20 43k 0 [ HOST ... ... ... ] 2K,1 1022K,6. Ok, cool – so where do I get this card? 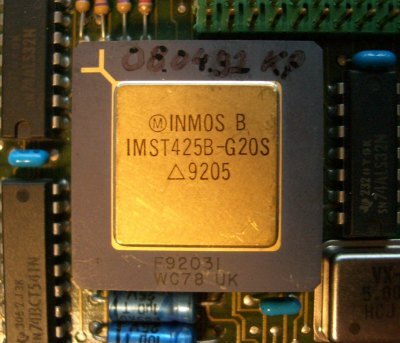 Well, AVM is still very alive-and-kicking but they’re not building these cards (using transputers) anymore… even if they wanted to, Inmos/SGS killed the transputer back in 1993. So eBay is your friend. Yes! AVM build(s) 4 major versions of the B1: V1 to V4. V1.x – Available as ISA and MCA version. The perfect choice! Everything important is socketed, no SMD parts. V2.x – ISA version only. CPU & RAM is SMD. Ready to play with but not much to mod. V4.x – PCI version only. No transputer anymore. “StrongT” Controller… might hint towards a StrongARM based thingy. Again: If you want to do all the hacks described here you have to get a Version 1.x card! The T400 is OK to begin playing with this card, but it only offers 2K internal RAM (vs. 4k in the T425/800) as well as it has only 2 links: One connected to the C012 (and this going to the ISA interface) and one is available. I was under the impression, that AVM might use the other link to interface to the ISDN part, but that seems to be memory-mapped. Changing to a T425 gives you more internal RAM (=speed) and the possibility to use 3 external links to talk to more connected transputers. A T800 would be the top-of-the-hill, featuring an FPU which will speed up your Mandelbrot tremendously. Next up, the RAM. Albeit the standard 1MB are plenty enough for nearly all fooling-around you might plan, there’s another Axel-Law to be followed: “If there’s an empty socket, fill it!”. Also if you’re going serious and think about running the Helios OS on this card, you’ll better have 2MB! 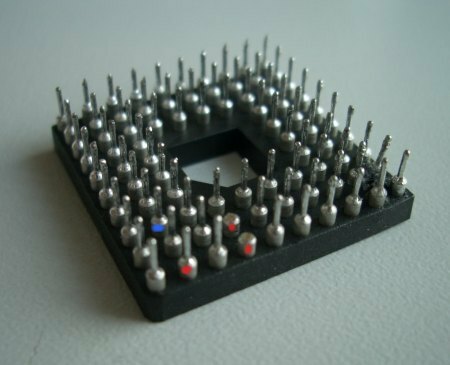 You need to get eight 256Kx4 chips – they’re pretty common. They should be faster than 100ns… you’ll read later why. The eagle-eyed reader might spot the different makers of the RAM chips. That’s because I’ve salvaged 2 old ISA-VGA cards (each 512k) for the chips. All are spec’ed at 80ns. 0 T425b-20 43k 0 [ HOST ... ... ... ] 4K,1 2044K,6. Not bad, huh? But there’s room for improvement… the RAM is accessed extremely slow, set to 6 clock cycles which is very conservative, even for 100ns RAM parts. The RAM is controlled by the transputer itself – something the Intel-World introduced with the AMD Opteron years later! When booting, the transputer checks how his “MemConfig” pin (position C8) is connected to the MemAD[3-7] pins to determine the RAM speed. The AVM B1 has its “MemConfig” connected to MemAD7 (position K10) which we want to change to MemAD6 (J8) in the first step. 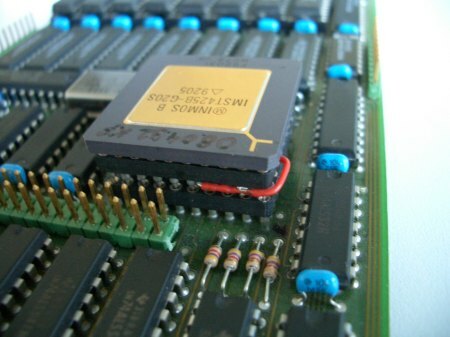 The AVM B1 is a 4-Layer card and unfortunately the wire connecting those two pins is running in the 2nd layer from the back. To find the trace we have to cut, hold the card in front of you looking at the component-side – like the first picture on this page. Now flip it vertically. You’re looking at the solder-side, the external connectors pointing to the left. A closer look at the transputer pins shows you where to cut and the wire connecting “MemConfig” with “MemAD6” – Pin A1 is in the upper left corner, counting down[123456789,10], letters right [ABCDEFGHJK]! The cutting is a delicate thing to do. So be very careful not to cut too deep. I did it by cutting carefully once or twice and then checking with a continuity-tester if MemConfig and MemAD7 are still connected. Repeat until the connection is broken. 0 T425b-20 43k 0 [ HOST ... ... ... ] 4K,1 2044K,5. Yay! RAM’s accessed a bit faster now. If that works and you’re like me (squeezing out the last drip of everything) you can try connecting to MemAD5 (J9). It worked for me. Faster Link Speed – Not for the fearsome! The next thing being rather sub-optimal is the link-speed… 43k/s is dran slow. That’s because it’s locked to 10Mbit/s by AVMs design even 20Mbit/s would be possible. Again, the transputer gets its configuration during boot-time via special pins. In this case LinkSpecial(A2), Link0Special(B4) and Link123Special(A4). Not a big deal, but in case of the AVM B1 it’s not solvable by simply putting those pins high or low. That damn card is -again- a multilayer card and one of those layers is a ground-layer. No way in cutting a trace here. Ok, first you have to get another 84-pin socket. It’s not so easy anymore to find those… luckly, I had one spare collecting dust. 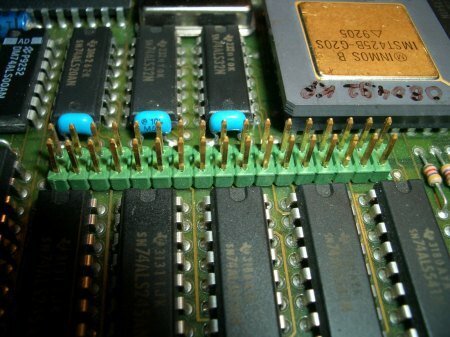 You might find an alternative socket meant for a Motorola 68881/2 FPU – but make sure it also has the inner pin-rows connected. Normally the 68881/2 has 8 pins less! 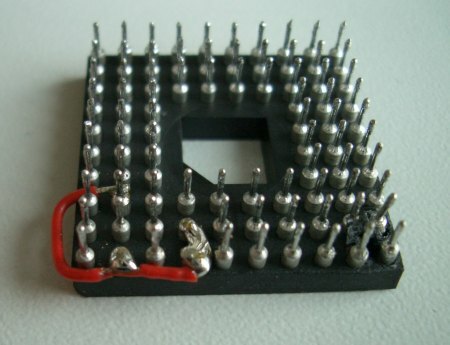 Another possibillity would be making a socket by glueing 10×1 pin-rows together. Not pretty but should do the job. For the second step, you’ll need a caliper and (again) the transputer pinout. 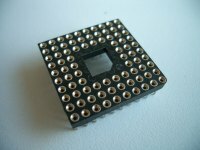 Orientate the socket so that pin-1 is in the upper left corner (the picture above shows this by the angled-corner in the center of the socket). Now identify the pins LinkSpecial(A2), Link123Special(A4) and Link0Special(B4) as well as one VCC-Pin of your choice (I went for C2). We need to connect those 4 pins, pulling all Link[n]Specials high… which gives us 20Mbit/s link speed! Note: If you plan to use the B1’s external links, you might consider not to change the external link-speed – read more about this in the next chapter. In this case do not change Link123Special(A4). So carefully cut the thin part of the pins A2, A4 (see note above!) and B4. Use a rasp/file to shorten the pin down to the thicker base (so the remaining part can’t connect to the original socket). 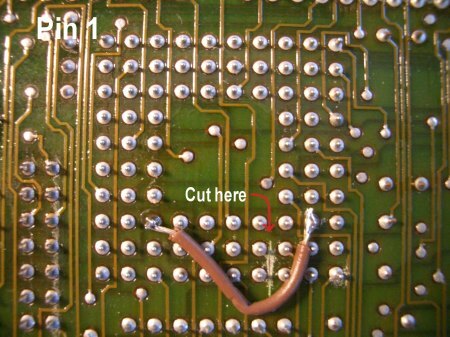 When everything’s nicely cut, use a wire to connect them together – it’s a bit tricky to solder between the pins, so use a fine tip. Now double check the modded pins for shorts to their neighbours!! Not doing so might kill your transputer/card!! Cool! Were half done. For the third step we need to adjust the other side of the link accordingly. 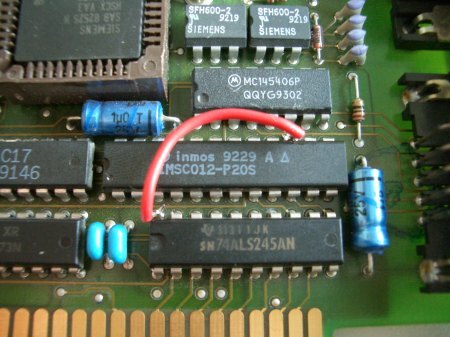 “The other side” is the Inmos C012 link-adaptor sitting in the lower right corner of the card -close to the ISA connector- labeled “IMSC012-P20S”. Identify pin-15 and use a thin caliper to cut its leg as close to the board as space allows it. Bend the remaining leg up and check that there’s no connection to the card anymore. 0 T425b-20 378k 0 [ HOST ... ... ... ] 4K,1 2044K,5. 378k/s is faster than my crappy Gerlach-card (@239k), even the AVM is also just using 8 data-lines of the ISA bus (being a 16-bit card it only uses 4 lines from the AT bus… for IRQs 10-13). So… what else can be done? Link & Reset (not inverted!) are brought to the outside!! Error and Analyse are hold to GND, though. Note: That said, AVM wouldn’t been AVM if they didn’t save a dime… the external links are buffered (at least) by a comparably slow 74BCT541 octal buffer. This offers a signal propagation delay of ~9ns while INMOS recommended to use “F” type buffers, which offer a speed of about 3-4ns. So 20mbps are too fast for this chip. 10mbps should work though. I started counting pins from the transputer, zig-zag, downwards. Interesting things coloured green.